Augmented reality can make for some fantastically impressive tech demos, and the rise of systems like Google's ARCore has started to bring AR to the masses, not requiring hardware any more advanced than the phone you already have. While phone-based AR feels like it has the potential to be quite popular, wearable AR devices have proven to be a tougher sell, and the public backlash against early efforts like Google Glass is still hard to forget. Still, companies soldier on trying to find a way to make this tech more palatable, and today we're learning about the new Bose AR platform, which earns the distinction of taking an audio-only approach to augmented reality. So many AR solutions are built around the idea of superimposing graphics over real-world imagery that the idea of an augmented reality system that's based only on sound can seem quite strange. Sure, we talk to our phones plenty, and wearables like the Pixel Buds connect us with voice-driven assistants, but when does that audio experience become capital-A-R augmented reality? What Bose envisions is a system that combines location data from your phone's GPS receiver with position information from a wearable device. While there's nothing commercially available just yet, Bose has come up with a prototype pair of glasses armed with sensors that can detect which way your head's pointed. Together with that GPS info, this gives Bose AR an idea of where you are and what you're looking at – all without a camera of its own. From there, what happens next depends a whole lot on the software you've got loaded on your phone. Bose is releasing an SDK for third-party developers to tap into Bose AR hardware, and suggests uses like looking up at the sky to get a report on the weather forecast, or walking through a historical site and hearing a simulation of what a day there might have sounded like hundreds of years ago. Slightly more pedestrian uses are also possible, like leveraging those position sensors for gesture-based music controls. For its prototype, Bose is using a new audio package that channels sound through the arms of its glasses, keeping your ears clear to also hear ambient sounds. In order to make the AR experience feel casual and natural, that factor could prove to be key: you don't have to feel like you're “plugged in” all the time, yet you can still take advantage of AR services when desired. Bose AR sounds like an interesting project, but there's going to be a lot of work to convince users this is something valuable they're missing from their lives. And honestly, these prototype glasses look pretty dang chunky, and we're going to want something quite a bit sleeker if we're to be wearing it around everywhere. Will you be giving Bose AR a chance? Or do your AR interests lie much more in the camera-equipped camp? March 9, 2018— This week at SXSW, Bose introduces Bose AR, the world’s first audio augmented reality platform, and glasses to hear— a Bose AR prototype that launches the future of mobile sound. Bose also announced its SDK schedule date for developers, manufacturers, and research institutions, along with collaborations currently under way, and venture funding for related start-ups. Unlike other augmented reality products and platforms, Bose AR doesn’t change what you see, but knows what you’re looking at— without an integrated lens or phone camera. 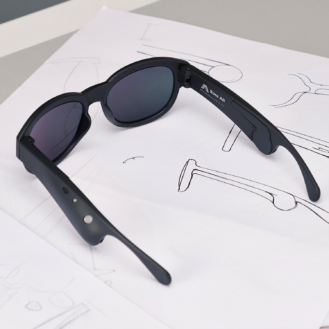 And rather than superimposing visual objects on the real world, Bose AR adds an audible layer of information and experiences, making every day better, easier, more meaningful, and more productive. Bose AR debuts a miniscule, wafer-thin acoustics package developed specifically for the platform, representing the future of mobile micro-sound with jaw-dropping power and clarity. It can be seamlessly built into headphones, eyewear, helmets and more, with no compromise to their existing functionality. And it allows simple head gestures, voice, or a tap on the wearable to control content— replacing the need to swipe, type, or tap a touchscreen for the same commands. 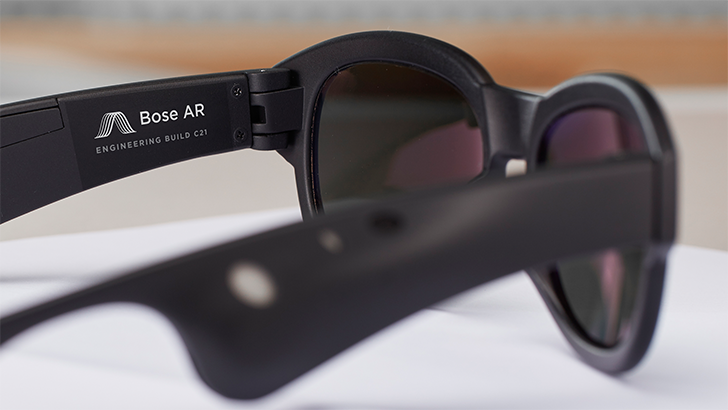 The first Bose AR wearable— a prototype pair of glasses— was engineered and manufactured by Bose. They’re Bluetooth® compatible with microphones for calls, Siri or Google Assistant. And they debut a new proprietary technology that keeps audio private. With an ultra-slim, ultra-light, ultra-miniaturized acoustic package embedded discreetly in each arm, they can fit, function and look like standard eyewear, but sound and function more like Bose headphones— delivering amazing, lifelike performance that no one can hear but you. The Bose AR platform is purposely straightforward, focused on improving daily life instead of extremes. In addition to delivering stunning audio quality for listening to music, talking on the phone, or using VPAs, a Bose AR wearable uses sensors to track head motion, and the GPS from an iOS or Android device to track location. 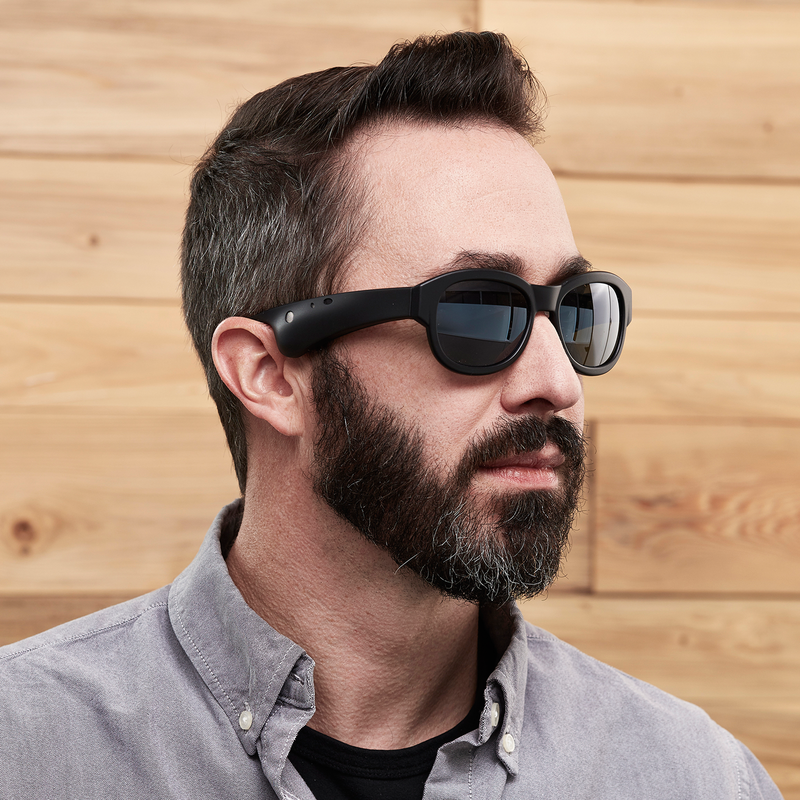 The sensors send the motion and location data to a Bose AR-enabled app that aggregates the information, sending relevant, real-time content back to the user’s ears instantly. It’s all done hands-free, heads-up, and wirelessly, so there’s no need to grab, read or touch the phone. And it can be used for multiple applications. Bose AR can make every trip easier and more meaningful, transforming sightseeing in to sighthearing. Like simulating historic events at landmarks as you view them— so voices and horses are heard charging in from your left, then passing right in front of you before riding off in the direction of their original route, fading as they go. Or letting you listen to a renowned speech “pinned” precisely to the famous person in a monument’s statue. Or telling you which way to turn towards your departure gate while checking in at the airport. Bose AR can make the world a classroom. Like translating the sign you’re reading. Or telling you the word or phrase for what you’re looking at in any language. Or explaining the story behind the painting you’ve just approached. Bose AR can put playlists right in front of you, so you can control them with gestures as easily as voice or touch. With your wearable on, you can choose or change your music with simple head nods indicating yes, no, or next. Bose AR doesn’t interfere with a wearable’s primary purpose— it adds useful information based on where you look. Like the forecast when you look up, or the restaurants on the street you look down. The Bose AR platform is open to approved developers and manufacturers. Collaborations under way include ASICS Studio, Strava, TripAdvisor, TuneIn, and Yelp. Bose is also collaborating with academic research institutions, including the MIT Media Lab to advance human interaction related to augmented audio reality, and the NYU Future Reality Lab. Additional agreements have non-disclosure terms and will be announced in the future. Bose will invest up to $50 million in start-ups focused on apps, services, or technologies for the Bose AR platform. More information can be found on the Bose Ventures site. The Bose AR SDK, and limited quantities of a refined and updated version of the Bose AR glasses, will be available this summer. Sign-up information and details can be found at Developer.Bose.com/Bose-AR. Bose Corporation is privately held. The company’s spirit of invention, passion for excellence, and commitment to extraordinary experiences can be found around the world— everywhere Bose does business.